The No. 28-ranked women’s golf team finished sixth at the 2015 Betsy Rawls Longhorn Invitational after three rounds of play on Monday and Tuesday in Austin, Texas. The Hurricanes completed the last tournament of their fall schedule with a 54-hole score of 884 at the par 72, 6,298-yard University of Texas golf course. The Canes did not have their best first two rounds as a team, but had a strong showing in round three to finish in the top half of the field. Both freshman Dewi Weber and senior Kailey Walsh got off to fast starts in round one on Monday. Weber had a scorecard with a little of everything, including an eagle, three birdies, two bogeys and a double bogey to finish at one under par. Walsh also shot a 71, but with an eagle, four birdies and five bogeys. 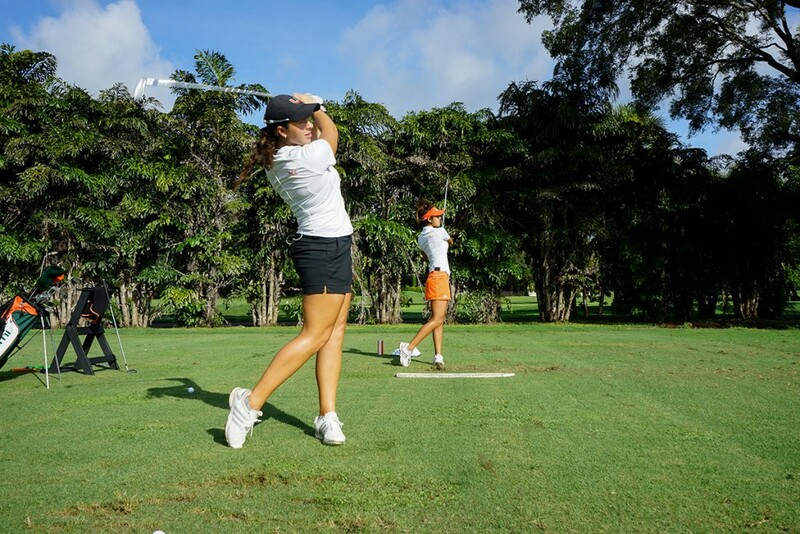 Junior Daniela Darquea, the top-seeded player for the Canes, scored a solid 72, but junior Delfina Acosta and senior Christina Ocampo struggled, shooting a 77 and an 81, respectively. Round two wasn’t much better, as every Cane failed to shoot under par. Acosta started off hot, birdieing four of her first five holes, but a heartbreaking quadruple bogey on the par-4 seventh hole clearly slowed down her pace. Acosta was the only Miami player to not shoot over par, finishing with an even 72 for the round. The Canes sat in eighth place after two rounds. Weber led Miami heading into the final round tied for 16th. Miami showed its resilience in round three on Tuesday, specifically Darquea and Weber. Darquea had a flawless round, finishing with four birdies and 14 pars for a score of 68. Weber also had a great round with four birdies and two bogeys that led her to a score of 70. Both players completed the tournament shooting a total three-round score of 216, good enough to be tied for sixth place. The Canes’ next tournament will be in the spring, when they compete in the 2016 UCF Challenge on Feb. 7 in Orlando.